Constellations: Sagitta -- Whose Arrow is it? This may be an arrow shot by Apollo to kill the Cyclops. Perhaps Hercules shot it at the Stymphalian birds. Perhaps he shot it at the eagle, or vulture that perpetually gnawed Prometheus' liver. Perhaps it is one of Cupid's arrows. Trace it backwards, and you find it comes from Hercules. Either way, it is an old constellation, and many cultures have seen an arrow in its five stars. 32k JPEG M71 (NGC6838) is a mag. 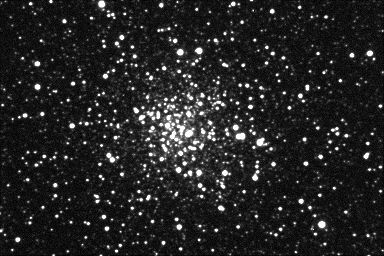 8.3 globular cluster located between delta and gamma Sagittae. Dreyer describes it as very large (7'), very rich, and condensed. Stars range from mags. 11-16. A pretty globular in a very rich field. A one minute exposure by Pedro Ré with a HISYS22 on a C-14. For more information on M71, click here.